To promote her new BBC television drama series 'The Cry', Jenna Coleman attended a special screening today(September 3rd) at the Soho Hotel in London. 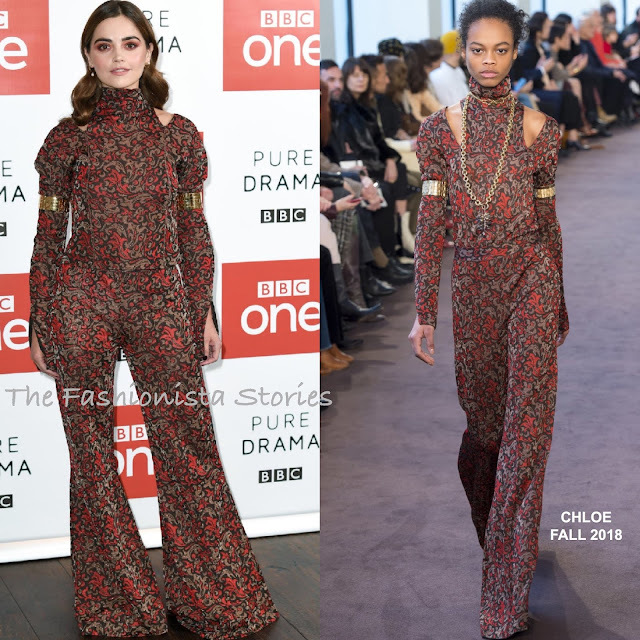 For the occasion, she wore a CHOLE FALL 2018 ensemble which featured a red & brown Baroque lurex jacquard knit turtleneck with slashed shoulders & split cuffs and the matching flared pants. The sleeves were adorned with the 'Tilly' brass gold bracelets. On one hand this looks like a jumpsuit but on the other, I don't like the look of the pants on her. Off-the-shoulder light waves and a red smokey eye finished up her look. Are you feeling Jenna's printed look?